As with the spirit of The Rankings Threads, suggest your own Top Decade list. There's no limit to this. 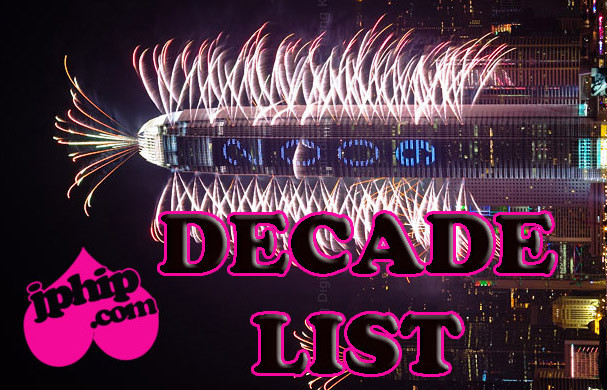 SO GET YOUR DECADE LIST ON!! I was going to make an actors of the decade list, but it turns out that I still don't watch enough movies and can't possibly make a long list when I've only seen like one movie from one great actor etc. When I first started watching the show I probably thought it was kinda boring and slowpaced and I had trouble understanding the slang in it. But I'm sooo glad I stuck with it because once I realized how brilliant it is, I couldn't think of anything better. The Wire is just so realistic, shows many different sides of a society, and all of the many characters are strangely connected to each other even if many of them never meet. The casting is great; instead of going for famous actors they chose people, some off the street, who fit the roles perfectly. I've still got some episodes of the last season to watch, but I know they will be great just like the ones before. Lost somehow has changed the way that I view television. There were shows earlier that made me not want to miss an episode, but not because it was essential to see them. Lost was the first show for me where you absolutely couldn't miss an episode or you would have no idea what was going on, or at least wouldn't have as much fun not knowing all the details. (Obviously I started watching The Wire later than Lost, lol) It's a show that keeps raising questions, and once in a while answers some of them. It had some low points, mostly in S2 and S3 (which is when most of those who stopped watching gave up), but once the creators got an end date for the show the writing obviously picked up, and S4 and S5 were great. Only final season is left now. The show isn't perfect, but I think if there had been no reason to do filler episodes between S1 and S4, it would be near perfect. Again a show where arguably the best moments were in the 90s, but whatever. I want to give props to Buffy because it's probably the first show that I've watched every episode of and because it's funny, smart, and has girlpower. lol The show had some of the funniest episodes of tv that I've seen, some of the saddest, and some of the most creative/random It's definitely influenced me a lot and I really want to watch it all again one day. Maybe I shouldn't put Dexter here because 1) I've only seen two seasons of it so far and 2) it's quite new. But the thing about Dexter is that, at least in my experience, it doesn't have any bad episodes. It's pure quality. The premise of the show (an emotionally cold but still strangely loveable serial killer working for the cops) just got me instantly, and even after the main character has changed (now actually cares about the ones he's with), the same interest and fascination with him and his story is still there. It's just a strange but totally awesome omg show. REALITY SHOW OMG. Well, because at its best Big Brother UK could be absolutely wonderful. The first and the best season of it that I've seen was the third one. The housemates were so real, entertaining and likeable. BBUK's strength has also been the creativity (&budget) of the staff in planning tasks that result in hilarious moments. Too bad in more recent years the casting hasn't been as good, or the show has been otherwise lacking... But at its prime, BBUK was very entertaining and gave us memorable characters (in a good way as well as bad). OH LAWD ANOTHER REALITY SHOW. Well, Survivor was like the father of all reality shows. I haven't watched the most recent seasons too much because I don't like the favourites that the show has recently had (like Russell? Ew, couldn't stand that for more than 2 eps). But at it's best, Survivor creates real suspense when you're not sure whose game plan is going to work out, provides funny moments and entertaining characters (who are real people omg), etc. Even if the show has been on for so long it still has surprising moments that make me go OMFGNOWAY, and that's something. Lol this was just such a fun, part ridiculous teen high school show. I'm listing it for the lols. A fucked up British show about teens, but also one of the more realistic shows about teens. It's definitely not one of the greatest shows ever, but it's somehow quite different from any other show about teens that I've seen and deserves props for that. ^ Yay thx!! Those were on my list of shows to watch!! I think most of what I remember is mostly recent stuff. Note that I pretty much only watch stuff on Youtube cuz most of this stuff isn't aired here. So there are probably a lot of shows that I haven't even seen. He was really my first introduction to these types of fun celeb interviews, as he was the first late night host whose show started being aired in Finland. Conan's very funny but after seeing Craig's interviews, even Conan's seem a bit awkward. Still, he's pretty good yahe ok. I'm really only listing her here because when people go on Oprah, it usually means they have something special to talk about that they would only reveal on Oprah. So that's why her. Celebs seem to trust Oprah to be graceful and respectful whatever they're going to say, and that makes 'em open up like a flower in spring uh huh. A lot of people seem to love her, but I only really know her from her interviews, in which she isn't always very smooth. But she does seem likeable and a lot of cool people go to her show (and seem genuinely happy to be there), so what the heck. * Yeah, I don't watch enough TV shows lol. Too much sports.